"Fear is real, but God is bigger, and His love is stronger. My story is a testament to that. There is nothing in this world more beautiful or wonderful than God Himself, who invites us into relationship with Him through Jesus Christ. There is no greater hope for our broken humanity than that." 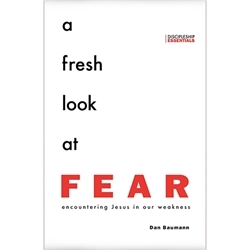 In this deeply personal and powerfully honest book, Dan Baumann helps us navigate our own fears by detailing his own and exploring God's place in the most doubt-filled, worrisome, and frightening areas of life. This book will challenge you to look at fear in a new way and guide you in being transformed by the greatest reality of all-Jesus Christ. "Fear is a profound force-it paralyzes people, controls communities, and shapes nations. But it does not have to be that way! My close friend Dan Baumann knows what it means to look fear in the face and to follow Jesus instead. Let him show you how." "Dan Baumann, a friend of many years having worked in some of the most difficult places in the world, really does understand fear and how to overcome it. As one who has walked through imprisonment and war and treks over treacherous territory, he has much to teach us. This book will be important to you during troublesome times. If you are called to adventure, this book is a must for you."